I have a Christmas confession. Santa has never brought my children toys for their stockings. It is sad really, because stocking were one of my favorite parts of Christmas. First we didn't have them because we didn't have a fireplace, but even after I found fun ways to hang a stocking without a fireplace we still didn't fill them with anything. They were just decorations. So I am making a vow that next Christmas we will not only hang stockings, but Santa will actually leave treats in them. That gives me a year to find the prefect stockings for our family. 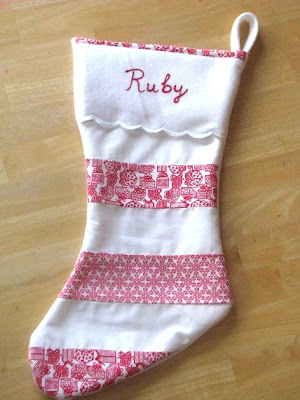 I might just try dressing up some plain red stocking I bought a couple of years ago with a felt garland like these fun felt garland stockings from Bijou Lovely. 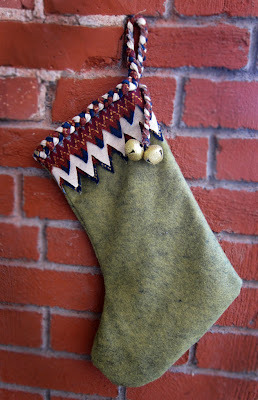 Or if I get brave I will try this easy stocking tutorial from Diary of a Quilter. I fell in love with this scalloped stocking tutorial because I love scallops and, of course, I love Ruby. 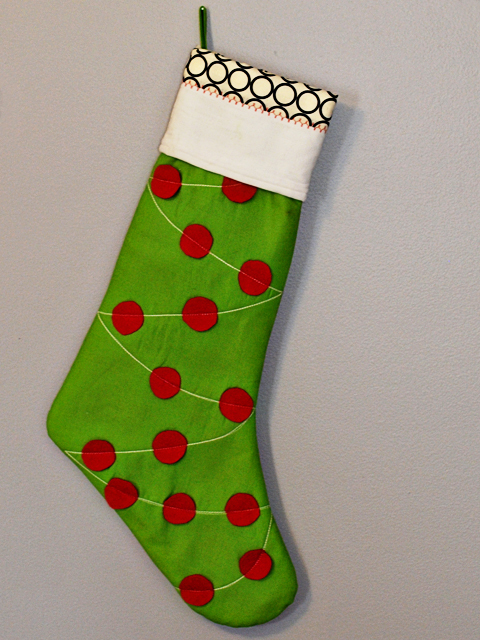 But I also like this easy elf stocking tutorial over at The Crafting Chicks. And I the layers on this wool felt stocking over at Prudent Baby. 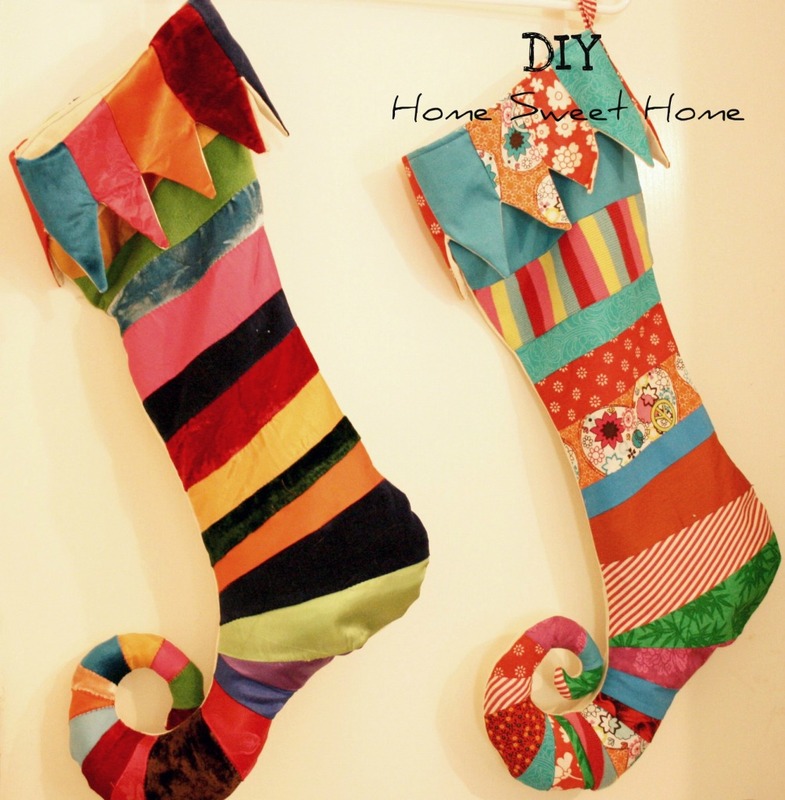 And I love this cute patchwork stocking tutorial DIY Home Sweet Home but I fear it is out of my skill level. You know, since I don't sew! But that doesn't mean I can't talk someone into making them for me. Stockings are our favorite part of Christmas. They are the very last thing we do on Christmas day. Its a tradition that my husband brought to our celebration. Each stocking gift is wrapped in red tissue paper. Even though our stockings are huge, there are always overflow gifts. Only the overflow gifts can be unwrapped before the official "stocking opening" time. I usually fill the stockings with useful things (ie toothpaste & brushes, shampoo, underwear, socks, other toiletries, etc.) along with some fun or asked for gifts. Somebody always recieves a movie that we watch when all the festivities are over for the day.